Nicky Wire was at home, outside Cardiff, when he learnt that ‘A Design For Life’ had debuted at number two in the charts. He was happy enough, and planned to celebrate with a Sunday tea round at his Mam’s. His neighbours had taken to waving at him now, more friendly than before. In the past they’d seen this odd figure cabbing it up the valley from town at the finish of the band’s tours - exotic and exhausted. Nicky would frantically mow the lawn for a couple of days and then disappear again. Now they could appreciate his job better. “See you on Top of the Pops, then,” they would remark, smiling. But Nicky had a more pressing matter to deal with. As planned, he rang up Sherry Edwards, mother of Richey, the band’s missing guitarist. He told her of the band’s good fortunes in the charts, and she was glad for them. After 15 months of endless anxiety - of false sightings, upsetting letters and then the depressing business of setting up a trust fund for her missing son - this was a welcome respite. Sean, like Nicky had found a kind of contentment with his “amazingly boring” lifestyle. Here was a Generation Terrorist who enjoyed DIY, as well as amassing loads of of hi-fi and computer ware. It the song ‘A Design For Life’ was written about the control of the masses - keeping the proles down with economic and political constraints - then Sean took some satisfaction in the knowledge that he was bucking the financial trend by spending his way out of recession. Even so, he didn’t think the band’s success (94,000 copies sold in a week - only 7000 behind the leader, Mark Morrison) was worth a special celebration. When his Mum had told him earlier that she’d bought a bottle of champagne, Sean told her she should only pop the cork if the record went straight in at number one. So it was up to James Dean Bradfield to mark the occasion properly. By his own admission he was “a bit of a boy” and based himself in Hammersmith, west London for the night. This area was frequented by a tight gang of Manics friends - management, press, record label people and musicians. Many of these pals were like family, directly connected to the band’s original manager, Phillip Hall, who had died of cancer in December 1993. Phillip had been a good time bloke, always up for a party when it presented himself. He also had a zen-like manner about his business dealings, allowing him to suffer difficulties with a cheerful demeanour. The band’s high profile was a tribute to his style. At first they briefly allude to themselves and the unenviable time they suffered in 1995. For a group that was so famously brazen in the past, they often talk in euphemisms now - referring to Richey’s ‘thing’ or his ‘whatever you call it’ - when mentioning their friend’s breakdown. Nicky even blushes on a few occasions, as though he feels uncomfortable talking about this at all. Sean is mainly quiet, only butting in when he feel that his friends haven’t expressed a point as accurately as they might. James is more sporadic and emotional - you feel that he’s been the most frustrated member of the band. Without a steady partner and a domestic lifestyle, he’s the one that goes pinballing around London parties - a gifted musician who has most to achieve from travelling and playing plenty. In cold print, James’ outbursts occasionally seem cold-blooded, but that’s not the deal at all. We start by mentioning the success of ‘A Design For Life’. 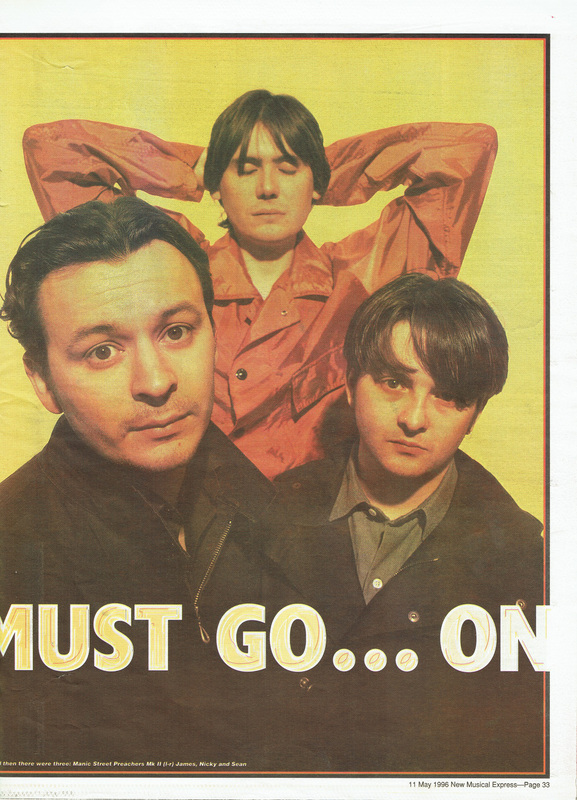 Six years ago, the Manics were ridiculed by many people in the industry - laughed off as a provincial folly, an out-of-time aftershock of the punk era. They drank Babycham! Wore women’s blouses! Said they would sell 20 million copies of the debut album! How the cynics sneered. But not even the headline believers - the mascara-rimmed weirdos, the malcontents, the rockers and the mentally frail souls who mad up the Manics congregation in the ensuing years - would have predicted such an outcome as this. Since the Manics went away in 1994 we’ve seen a new type of fan emerging - the Britpop kid. Did you worry about how you’d fit in with this changing audience? James: “I didn’t feel that I could give or receive anything - in an emotional outburst, or bond with an audience or anything. I didn’t want to see people in the front row going [he makes a weeping noise]. It was funny walking around onstage in Dublin as the Oasis support. There were loads of little girls at the front and you could tell that they were looking at me and thinking ‘Is that a roadie?’ They didn’t have a clue who I was. It was a bit more fun. Shaun Ryder had been treated under a similar system in 1993 when his appetite for crack and heroin had precipitated the decline of the Happy Mondays. One of the 12 points asks you to recognise that there’s a higher power than yourself - a God of some description. Shaun used the image of his grandmother to represent the good aspects of life. Richey had a lot of trouble with this. He couldn’t use the image of a person of a favourite pet, because they would die on you. So what else was there? He was still working on that conundrum when we left him. James, Nicky and Sean had offered Richey a non-touring role in the band. He could stay at home writing lyrics and designing the Manics artwork instead. But Richey couldn’t agree to that - he felt he would be shirking from the toughest part of the job. So he toured with the band in France, supporting Therapy? for 11 French dates through the end of September, into October. There were few distractions - hardly anyone spoke English, and it was fine. The European tour with Suede, starting on November 7, was an appalling experience. James would stay up all night drinking - the rest wouldn’t see him until 7 p.m., just before show-time. James figured that was OK, because he thought they disliked his company anyway. Generally, Richey didn’t care about his lack of guitar skills. James would give him lessons, but there wasn’t a great improvement - and besides, James said he always envied Richey for his cheek-bones. Wasn’t it as important, James argued, to take a good photo as to take a cool lead break? But Richey became intrigued by the life and death of Def Leppard guitarist, Steve Clarke. He was a good player, but he’d become terribly fraught before a show - once even breaking his knuckles on a wash basin, so he wouldn’t have to go on. In the same spirit, Richey used to dream about chopping off his fingers. Then he went out and bought himself a butchers cleaver. The Manics played a terrible show in Amsterdam and everyone was depressed, except Richey, who was oddly cheerful. Afterwards, Nicky pulled up his friend’s shirt to discover he had carved a vertical slash down his chest. “I feel - alright now,” said Richey. Nicky was in bits, but since there were journalists over to see the band, Sean took them out to a club, pretending nothing had happened. 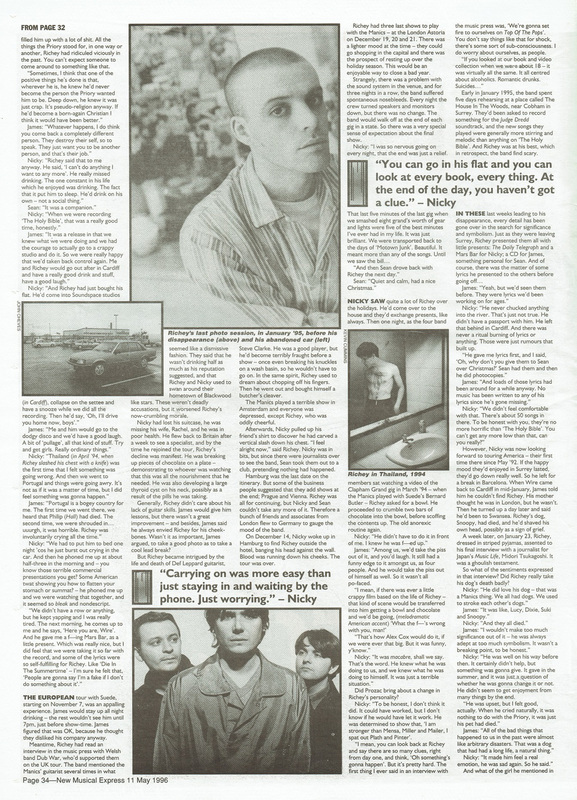 Richey had three last shows to play with the Manics - at the London Astoria on December 19, 20 and 21. There was a lighter mood at the time - they could go shopping in the capital and there was the prospect of resting up over the holiday season. This would be an enjoyable way to close a bad year. Nicky saw quite a lot of Richey over the holidays. He’d come over to the house and they’d exchange presents, like always. 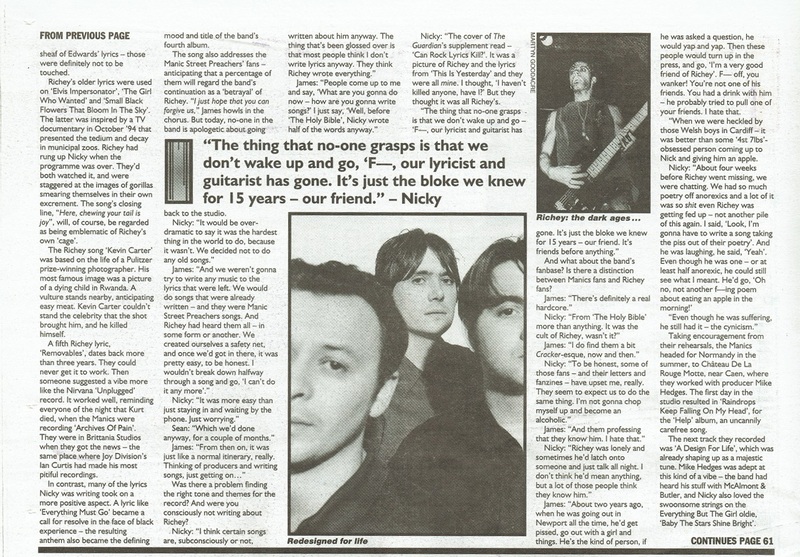 Then, one night, as the four band members sat watching a video of the Clapham Grand gig in March ’94 - when the Manics played with Suede’s Bernard Butler - Richey asked for a bowl. He proceeded to crumble two bars of chocolate into the bowl, before scoffing the contents up. The old anorexic routine again. However, Nicky was now looking forward to touring America - their first time there since May ’92. If the happy mood they’d enjoyed in Surrey lasted, they’d go down really well. So he left for a break in Barcelona. When Wire came back to Cardiff in mid-January, James told him he couldn’t find Richey. His mother thought he was in London, but he wasn’t. Then he turned up a day later and said he’d been to Swansea. Richey’s dog, Snoopy, had died, and he’d shaved his own head, possibly as a sign of grief. James and Richey checked into the Embassy Hotel on Bayswater Road, London, on the evening of January 31, 1995. 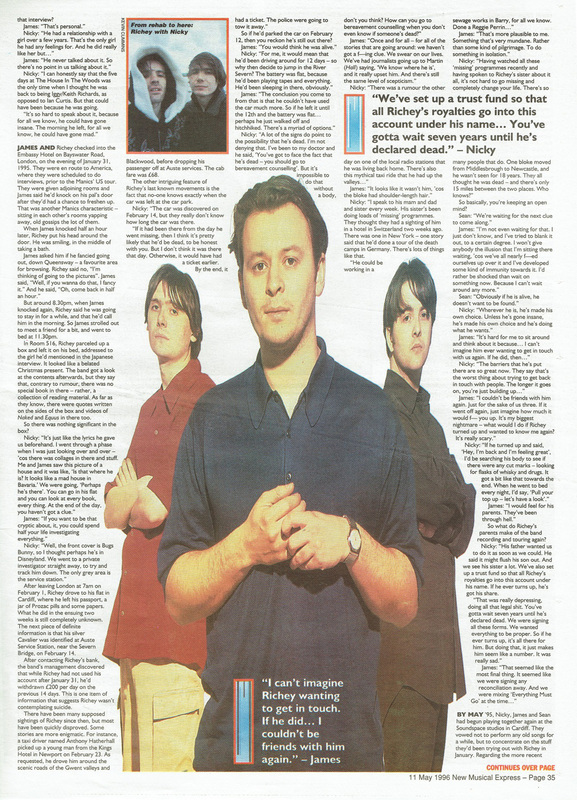 They were en route to America, where they were scheduled to do interviews, prior to the Manics’ US tour. They were given adjoining rooms and James said he’d knock on his pal’s door after they’d had a chance to freshen up. That was another Manics characteristic - sitting in each other’s rooms yapping away, old gossips the lot of them. In Room 516, Richey parcelled up a box and left it on his bed, addressed to the girl he’d mentioned in the Japanese interview. It looked like a belated Christmas present. The band got a look at the contents afterwards, but they say that, contrary to rumour, there was no special book in there - rather, a collection of reading material. As far as they know, there were quotes written on the sides of the box and videos of Naked and Equus in there too. The Richey song ‘Kevin Carter’ was based on the life of a Pulitzer Prize-winning photographer. His most famous image was a picture of a dying child in Rwanda. A vulture stands nearby, anticipating easy meat. Kevin Carter couldn’t stand the celebrity that the shot brought him, and he killed himself. A fifth Richey lyric ‘Removables’, dates back more than three years. They could never get it to work. Then someone suggested a vibe more like the Nirvana ‘Unplugged’ record. It worked well, reminding everyone the night that Kurt died, the Manics were recording ‘Archives of Pain’ in Brittania Studios - the same place where Joy Division’s Ian Curtis had made his most pitiful recordings. In contrast, many of the lyrics Nicky was writing took on a more positive aspect. A lyric like “everything must go” became a call for resolve in the face of black experience - the resulting anthem also became the defining mood and title of the band’s fourth album. The next track they recorded was ‘A Design For Life’, which was already shaping up as a majestic tune. Mike Hedges was adept at this kind of a vibe - the band had heard his stuff with McAlmont & Butler, and Nicky also loved the swoonsome strings on the Everything But The Girl oldie, ‘Baby The Stars Shine Bright’. While they assent to talking at length about Richey, they are adamant that their return to music shouldn’t draw on the image or reputation of their absent friend. On no account must it seem like they’re exploiting this story. 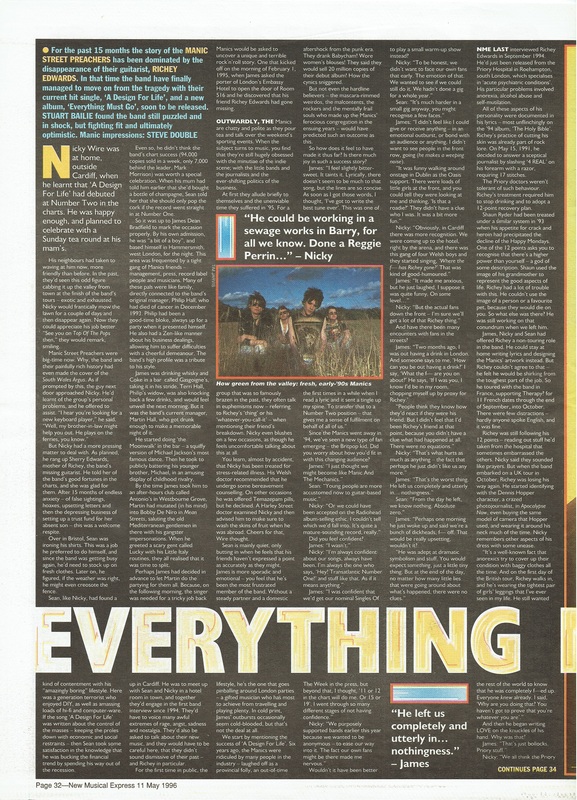 Hence their reluctance to do any press interviews in advance of the single’s release, and the fact the promotion of the band uses graphic images rather than photos of the remaining three members. This self-effacing style is partly a result of the band’s growing old - they don’t want to be dressed in combat fatigues or sailor suits any more. But as hyper-literate pop fans, they also know that there is one band who dealt with the loss of a focal member in a similar fashion. But you can’t really fault Nicky, James and Sean for wanting to change their situation - choosing bouts of normality over chaos, plugging for optimism rather than self-immolation. Behind them lies an awful, unanswered lyric: “from despair to where?” Part of their job now is to respond to that poser. The French thinker, Jean-Paul Sartre came up with a neat line about this conundrum 50 years ago. “La vie commence a l’autre cots du desespair,” he wrote. Life begins on the other side of despair. Way to go.